What has this to do with our plans to release the full catalogue? As a painter hates to show his portrait before it is finished, I am not willing to show an incomplete piece of work. Therefore, I plan to do a first full release when the catalogue has reached 12,000 entries for the period 1947-2005, which might occur at the end of year 2011, the aim being to improve the utility of the database. In the meantime, as I have constantly repeated since the start of FOTOCAT Project, all students of UFO phenomena should be aware that specific regional case lists are available upon request, because the work on FOTOCAT is basically a service to the UFO community at large. I thank US writer Richard Dolan for having provided us with xeroxcopies of the entire collection of NICAP's UFO Investigator journal (1957-1980), as well as the published issues of The APRO Bulletin from 1974 to 1985. Documentary support received from American researcher Jean Waskiewicz is also most appreciated. Our thanks also to this new friend who recently submitted information to our program: Ángel Rivero López, from Sevilla, Spain. AFU from Sweden (Archives for UFO Research), a remarkable organization which probably owns the most impressive collection of UFO materials in Europe, has donated to FOTOCAT Project 69 issues of Fate magazine from the historical period 1967 to 1982. We thank our colleagues of AFU, especially to Anders Liljegren, and we hope that this is the first of several succesive donations. It will certainly allow us to find interesting items to enter into our database. Since the end of the eighties, Denis Breysse, professor of civil engineering at Bordeaux University, has been managing the Becassine project, a database for CE3 cases worldwide. He has sorted out his catalogue for incidents where photos of objects or creatures have been obtained to check with FOTOCAT. This section will display a sample of UFO photographs or footage which study is revealing, or educative at least. 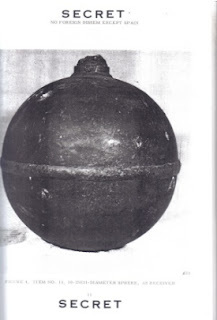 One of the spheres recovered in Spain on December 1965 as pictured in the Battelle report. At 20:55 hours of December 6, 1965, several reputed witnesses observed a formation of seven lights moving during 1.5 minutes in a NW-SE direction from Arroyomolinos de León, a village in the Huelva province, close to the border of the Badajoz province and not far from Sevilla province, in the South of Spain. This sighting was not reported to the press but it was known by Spanish ufologist Ignacio Darnaude, who in turn informed his colleagues. At 21:00 hours, a series of explosions were heard by a shepherd near Montemolín and he saw a burning object that fell from the sky one kilometer from his position with a noise “like a train arriving to a station”.The following days several spheres and other metallic objects were found at three different locations, Fuente de Cantos and Montemolin (in the Badajoz province) and Lora del Río (Sevilla province), three villages separated by 100 km and perfectly aligned in a NW-SE track. The discovered debris was retrieved and submitted to the Air Force staff and inspected -initially- by technicians from the Talavera La Real AFB and then by scientists from the Instituto Nacional de Técnica Aeroespacial (INTA), the National Institute of Aerospace Technics. These news were published in the Spanish press, even with photographs of the recovered spheres. 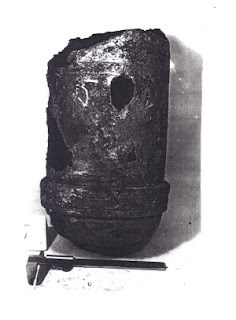 Photograph of the backfire rocket found, included in the INTA report. From the very beginning, military investigators suspected that it was the result of the decay of a Russian space vessel. As early as January 1966 Colonel Kenneth L. Lueke, air attaché of the US Embassy in Madrid, requested access to the preliminary analysis findings, and later on (October 1966) made an official request to the Spanish Ministry of Foreign Affairs that these materials be loaned to the United States for its own scientific appraisal. When a green light was given by General Franco, the Spanish Government agreed late in January 1967 to ship several of the recovered pieces to the United States. On the report cover page, two stamps explicitly warned that the document was excluded from declassification and that it contained information affecting the National Defense of the United States and was within the meaning of the espionage laws. In the decade of the nineteen nineties I was assisting the Intelligence Section of the Spanish Air Force's Mando Operativo Aéreo (MOA), or Air Operative Command, in the development of the declassification process of the UFO archives of the Spanish Ministry of Defense (references 1 to 5). One of the various objectives I achieved during this period (1991-1999) was to convince the Air Staff, first, and the MOA later, to release orders and take actions to ensure that all the UFO-related documentation dispersed among several air regions and bases was centralized. This was made three times. Because of this, the number of files was increased from 55 to 84, covering 1962 to 1995. Every single page was declassified. During 1994, an old file found in the Intelligence Division of the Air Force Staff Headquarters was sent to the MOA (based at Torrejón AFB, Madrid). It was filled with examples of objects found on the ground that had to do with aeronautical or astronautical events. In spite of this not being directly related to UFO sightings, it was thought that this was better remitted to the MOA for their information. This package contained everything related to the December 1965 spheres and other metallic parts from the space probe retrieved in South Spain, 43 years ago now. In the course of one of my numerous telephone contacts with the MOA Intelligence Section during this term I was informed that all the documentation pertaining to this event had found its way to the MOA. I have always been very much interested in the phenomenon of space reentries, and this 1965 decay case had specially intrigued me since it occurred, therefore I rapidly requested authorization to consult the file and I was granted permission. Not only that, I was invited to review all the documents on site, where I was also provided with a full set of photocopies of some 400 pages of official correspondence, memoranda and reports, both from Spain and US sources. Our own investigation has resolved that the alignment of the debris on the Spanish surface and the specific date (December 6, 1965) matches the last orbit of the decay of a SL-6 platform booster. It was a unannounced Russian launch conducted on December 3, 1965 with the probable mission of achieving the soft landing of Lunik 8 on the Moon. However, the retrofire was late and the spacecraft impacted on the lunar surface in the Sea of Storms. The main Battelle report conclusions -using more sophisticated analytical tools- confirmed what the Spanish technicians had found. There were four spherical bottles and a cylindrical rocket motor case, all manufactured with titanium alloys, with steel and molybdenum also identified. The three larger spheres were gas-pressure storage bottles, the small sphere was possibly a component in a hydrogen reservoir system with remote valve control. The rocket motor case was to provide propulsion. It was deduced that the temperature attained during high-velocity reentry rose above the melting point of titatium (3,000º F) for only a fairly short period, after which friction was reduced allowing the vessels to cool nearly to ambient temperature (certainly below 500º F) by the time of earth impact. Impact velocities were probably in the range of 100 to 200 mph. On February 3, 2009 I have formally submitted a request to the Commander in Chief of Mando Aéreo de Combate (MACOM), or Combat Air Command (renamed for past MOA) that the whole set of documents be declassified because of its relationship to a known civilian UFO sighting. V.J. Ballester Olmos reviews the documents in his cabinet. © J. Cuéllar/EL MUNDO. (1) Ballester Olmos, Vicente-Juan, “Spanish Air Force UFO Files: The Secret´s End”, in MUFON 1993 International UFO Symposium Proceedings, Walter H. Andrus, Jr. and Irena Scott (eds), MUFON (Seguin, Texas), July 1993, pages 127 to 168. (2) Ballester Olmos, Vicente-Juan, Expedientes Insólitos, Temas de Hoy (Madrid), May 1995. (3) Ballester Olmos, Vicente-Juan, “UFO Declassification in Spain (Military UFO Files Available to the Public: A Balance)”, in UFOs: Examining the Evidence, Mike Wooten (ed) , BUFORA (UK), August 1995, pages 51 to 56. (5) Ballester Olmos, Vicente-Juan, “Monitoring Air Force Intelligence (Spain's 1992-1997 UFO Declassification Process)”, in MUFON 1997 International UFO Symposium Proceedings, Walter H. Andrus, Jr. and Irena Scott (eds), MUFON (Seguin, Texas), July 1997, pages 139 to 178. UFO research enjoys few certainties and, unfortunately, most of these relate to resolved incidents. Only when you can demonstrate that a given sighting was due to Venus, a fireball, an aircraft, a balloon or other conventional object, do you apprehend the real nature of the event. In the remainder of cases, under the umbrella label of “unidentified flying objects”, we find a conglomerate of diverse incidents having a wide spectrum of reliability, strangeness and information quality. Sometimes these are not objects, not flying and probably capable of being identified if more information existed. As for the best cases, these are always on hold inasmuch as further research or more data is expected. Therefore, because IFOs are part of the problem and because they provide certainties, I find it practical to provide examples of such certainties, i.e. solved mysteries, for education. I consider that the more false unknowns are reported, the more time the research community will be able to concentrate on key, anomalistic cases. It is based on this philosophy, the added value of the learning process and the usefulness of having explained reports as random samples for statistical testing, that this blog usually contains accounts of “UFOs that never were”. Two examples follow immediately below. On November 21, 1997, a British tourist filmed the displacement in the sky of a fiery light at 01,30 hours from the Puerto Rico beach in the South of Gran Canarias, one of the Canary islands (Spain territory in the Atlantic Ocean, off the Africa coast.) It was preceded and followed by meteoric activity. It turned out to be the reentry of a Soyuz rocket booster, used to place into Earth orbit the Resurs F-1M satellite for geophysical research. In its decay it presented a radar cross section of 26.5 m2 according to NORAD. As an informative tip, we have included here the video clip originally obtained. VIDEO 1. Luminous display sighted and filmed from the island of Gran Canaria on November 21, 1997. © Gary Chapman. • A Flying Structure Over the Earth? In the “Equipe UFO” forum of November 13, 2008 (a list made up with consultants to Brazilian Revista UFO magazine), ufologist Roberto Pintucci explained this to be a plantation in the desert, probably Israel. He states he had observed the same field structures through Google Earth. Why am I not surprised? Now we will comment upon the photographic records compiled for the period 1980 to 1989, a decade that produced 843 entries, the lowest figure since the decade of the 1950s. The ever-increasing trend of the sixties and seventies broke down in the eighties, to recover again in the nineties. This fact must have a cause, economic, sociological or political that calls for an explanation. Illustration of a typical “flying saucer” picture in the 1980s. Charleston, South Carolina, April 4, 1980. © William J. Hermann. Credit: Wendelle Stevens & August Roberts, UFO Photographs Around the World Vol 3, UFO Photo Archives, 1993. The extreme years 1980 and 1989 mark the highest points in case reporting, while the remaining eight years in between present a level of photographic sightings almost one-half, with 1987 with the lowest rate. What happened in this year? The UFO/IFO ratio is 59 to 41 in this decade. These percentages remain generally stable over the period, with three exceptions: 1982 and 1984 have UFO percentages of 72% and 74%, which is due to the high incidence of examples of the Hessdalen phenomena, and -sensu contrario- the year 1987 holds a 60% IFO rate, which is explained by the many Gulf Breeze fakes perpetrated by Ed Hanson aka Ed Walters. The USA heads the list, as expected, by country size and population, enhanced by the subject's popularity. Then there follows Spain (author's homeland, where a major case search has been made), Norway (the combined effect of the emergence of Hessdalen phenomena and the Ballester-Brænne local study) and Argentina (resulting from a special project underway by Ballester and Ferguson). These are the major highlights to consider in the regional distribution of reports. 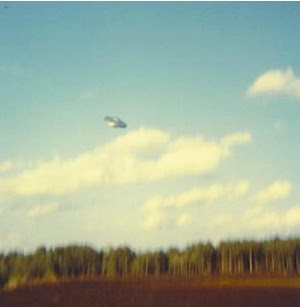 Flying disk image of an unseen object, photographed in the Vancouver Island (Canada), October 8, 1981. © Hanna McRoberts. Credit: Dr. Richard F. Haines. On July 25, 1979, Mr. Federico Ibáñez Ibáñez, 54-years-old farmer from the town of Turís (Valencia, Spain) claimed to have witnessed a “half-egg” shaped object landed on a rural lane. Two strange-looking, short beings with long black “glasses” appeared from behind a nearby tree and ran to enter into the object, which rose rapidly and soon disappeared from sight in the heavens. This was one of the best studied landing reports in Spain, investigated by two groups of researchers soon after the event. Firstly, by a large group of university students under the leadership of Juan-Antonio Fernández Peris. A detailed, 14-page report combining all the field work and findings was included in the book Los OVNIS y la Ciencia (UFOs and Science) by fellow field investigators Vicente-Juan Ballester Olmos and Miguel Guasp, published by Plaza & Janés (Barcelona) in 1981 and 1989. 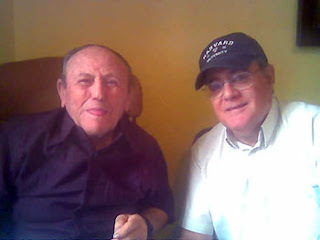 Thirty years later, on September 2008, I came back to visit the witness for a reinvestigation, in the company of Luís R. González. In the following November I returned to Turís with the photographer Rafael Márquez to stand by the landing spot once more with the percipient, as well as to talk to village folks. 84-year-old claimant of landing and occupant event (left) with V.J. Ballester Olmos in 2008. Mobile-phone picture by Luis R. González. The bottom line for this writer is that it seems improbable (according to ordinary standards) that this is a bogus tale. It llooks like a solid story, stable in time, with no apparent weaknesses, told by a totally normal and healthy person, a quite wealthy local farmer with excellent reputation in the neighborhood. The more negative points are that we have a single observer with no supporting witness (an unfortunate pattern in most of such incidents) and reported beings of a humanoid appearance which is quite atypical in the literature. On the other hand, regular-shaped traces found by investigators in 1979 can be considered to be complementary (yet only circumstancial) evidence. However, Carol has this suggestion for amateurs who want to implement this technique easily: If you're not sure if you want to get into stereo photography, but want to see if you can make a stereo image, the easiest way is to use your regular camera and take two photographs using the side-step method (also known as the astronaut shuffle because the astronauts used this method on the moon to make stereo images with a Hasselblad.) All you have to do is compose the image in your viewfinder, then shift your weight onto your left foot and make the first exposure, then shift your weight over to your right foot and make the second exposure. Cover of the last book by Paolo Toselli. Cover photograph of the book edited by Ricardo Campo. Fully multidisciplinary in scope, it is divided in two parts. The first part addresses the UFO phenomena especially from a psychosocial perspective, with the contribution of seven authors, most trained in social sciences (journalism, anthropology and law) but also in telecommunications engineering. The second part (six papers) is written by three astrophysicists, one theoretical physicist, one astronomer and a journalist, to attack the complex study of the life in the Universe. As reviewer Alfonso Ferrer has stated, it is a honest reflection on the state-of-the-art that must be confronted by anyone who is passionate about the study of UFOs. To this we add that high-caliber, well-documented skeptical views (as opposed to armchair speculation) help us to keep our research tools sharp in this extremelly complicated investigation. Crear un catálogo con tanta información tabulada, algunas de cuyas columnas se han añadido cuando la recopilación ya estaba adelantada, presenta una gran complejidad de orden práctico. Principalmente, nuestra dedicación se dirige a tres actividades: (1) añadir datos para informes ya registrados, (2) revisar libros y revistas especializadas para extraer nuevos casos para el banco de datos (aunque tengo la fortuna de contar con magníficos colaboradores aquí y en el extranjero, el proceso es lento, dada la ingente cantidad de material publicado en 60 años), y (3) realizar investigación basada en los casos archivados para varios ensayos en marcha (un trabajo muy elaborado y un proceso incluso más lento). ¿Que tiene esto que ver con nuestros planes de dar a conocer el catálogo completo? Igual que un pintor aborrece enseñar un retrato antes que estar acabado, no tengo gran deseo de mostrar inacabado un trabajo de esta importancia. En consecuencia, imagino que una primera publicación completa puede hacerse cuando el catálogo alcance las 12.000 entradas para el periodo 1947-2005, lo que calculo que puede ocurrir a finales del año 2011. Entretanto, iremos mejorando el contenido de la base de datos cara a su mejor explotación analítica por parte de los usuarios. Sin embargo, como he repetido constantemente desde que inicié el proyecto FOTOCAT –y vengo poniendo en práctica desde entonces-, sepan todos los estudiosos que tienen a su disposición listados de casos para regiones concretas o para periodos determinados con sólo solicitarlo, ya que éste es un servicio público dirigido fundamentalmente a la comunidad de investigadores. Nuestras gracias a este nuevo amigo que nos ha facilitado varias informaciones de interés para nuestro programa: Ángel Rivero López, de Sevilla. El AFU de Suecia (Archives of UFO Research -Archivos de investigación OVNI), una notable organización que probablemente almacena la más impresionante colección de publicaciones OVNI de Europa, ha donado a nuestro proyecto 69 números de la revista Fate del periodo 1967 a 1982. Se lo agradecemos a los colegas del AFU, especialmente a Anders Liljegren, y esperamos que esta sea la primera de una sucesión de donaciones. De seguro hallaremos nuevos datos que consignar en nuestro listado. Desde finales de los ochenta, Denis Breysse, profesor de ingeniería civil de la Universidad de Burdeos, gestiona el proyecto Becassine, que se define como una base de datos para casos del tipo CE3 (aterrizajes con ocupantes) a nivel mundial. Estamos revisando ahora el contenido de su catálogo, en cuanto a los casos fotográficos, para determinar si hay episodios que adicionar a FOTOCAT. Queremos agradecer al escritor norteamericano Richard Dolan su amabilidad al remitirnos fotocopias de la colección completa del boletín UFO Investigator del NICAP (1957-1980), así como los números publicados de The APRO Bulletin de 1974 a 1985. También hemos disfrutado de apoyo documental de parte de la estudiosa norteamericana Jean Waskiewicz que mucho valoramos. (Hay que introducir los 3 dígitos que aparecen en el recuadro y pulsar “Download”, luego esperar 45 segundos y pulsar en “Free download”). Una de las esferas encontradas en el sur de España en diciembre de 1965, según ilustración inserta en el informe Battelle. A las 20,55 horas del 6 de diciembre de 1965, varios testigos de toda confianza avistaron durante minuto y medio el paso de una formación de siete luces que se movían en dirección NO-SE. Los observadores se encontraban en Arroyomolinos de León, una población de Huelva limítrofe con la provincia de Badajoz y no lejos del límite de la de Sevilla, al sur de España. Este avistamiento –que no llegó a la prensa- nos fue informado en su día por el ufólogo sevillano Ignacio Darnaude. Cinco minutos después, a las 21,00 horas, un pastor de la localidad de Montemolín escuchó una serie de explosiones y vio como caía del espacio un objeto incandescente, al tiempo que producía un sonido “como un tren llegando a la estación”, que cayó a un kilómetro de donde él estaba. En los siguientes días se hallaron varias esferas y otras piezas metálicas en tres poblaciones diferentes, Fuente de Cantos y Montemolin (provincia de Badajoz) y Lora del Río (provincia de Sevilla), municipios que distan unos 100 km y que están perfectamente alineados en sentido NO-SE. Los restos encontrados se llevaron a las regiones aéreas del Estrecho y Central y fueron –inicialmente- inspeccionados por técnicos de la base aérea de Talavera La Real y posteriormente por científicos del Instituto Nacional de Técnica Aeroespacial (INTA). Noticias relativas a estos hallazgos vieron la luz en los medios de comunicación, incluyendo fotografías de algunas de las esferas recuperadas. Fotografía de una de las piezas (un retrocohete) incluida en uno de los informes del INTA. Desde el principio, las investigaciones militares españolas sospecharon que los restos procedían de la reentrada de una nave espacial rusa. En enero de 1966, el coronel Kenneth L. Lueke, agregado aéreo de la embajada norteamericana en Madrid, solicitó tener acceso a los análisis preliminares, para más tarde (octubre) solicitar oficialmente al Ministerio de Asuntos Exteriores español que se prestaran esos materiales a los Estados Unidos para ser estudiados por sus propios expertos. Cuando el General Franco dio la luz verde a esta transacción política, el Gobierno Español aceptó a finales de enero de 1967 mandar a Norteamérica varias de las piezas recuperadas. Se impusieron varias condiciones en una pro-memoria secreta: un especialista español participará en los ensayos en los EE.UU., el tiempo empleado no excederá las cinco semanas (tras las cuales los materiales serán reintegrados a España), se entregará a España los resultados de los estudios y –esto resulta significativo- “los Estados Unidos se comprometen a mantener secreta su participación en estos trabajos”. Los cinco objetos entregados (tres esferas de 38 cm de diámetro, una esfera de 25 cm de diámetro y un motor de cohete de 36x19 cm) fueron analizados a conciencia por el Battelle Memorial Institute, bajo contrato con la USAF o el Ministerio de Defensa norteamericano y se devolvieron a nuestro país en mayo de 1967. 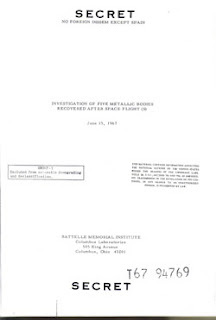 Con fecha 15 de junio de 1967, Battelle editó un grueso informe numerado T67 94769 con el título Investigation of Five Metallic Bodies Recovered After Space Flight (Investigación sobre cinco cuerpos metálicos recobrados tras vuelo espacial), sellado “SECRET No Foreign Dissem Except Spain” (SECRETO. No se autoriza su difusión en el extranjero excepto a España). Portada del informe Battelle. (Haga clic para agrandar). En la portada del informe hay otros dos sellos que explícitamente advierten que el documento está “excluido de desclasificación y reducción de categoría automática” y que “contiene información que afecta a la Defensa nacional de los Estados Unidos dentro de los supuestos de las leyes de Espionaje”. En la década de los noventa, yo colaboraba con la Sección de Inteligencia del Mando Operativo Aéreo (MOA) en el desarrollo del proceso de desclasificación de los expedientes OVNI custodiados por el Ejercito del Aire español (referencias 1 a 5). Uno de mis varios logros durante este período (1991-1999) fue haber convencido al Estado Mayor del Aire, primero, y al MOA, después, a que remitieran órdenes y tomaran acciones encaminadas a reunificar y centralizar toda la documentación OVNI que estaba dispersa en las distintas regiones, bases y unidades aéreas. A instigación mía, esto se llevó a cabo hasta en tres ocasiones distintas. Debido a ello, el número de expedientes se incrementó de los primeros 55 a los 84 finales (con casos fechados de 1962 a 1995). Todas y cada una de las páginas reunidas fueron debidamente desclasificadas y hechas públicas. Durante 1994, llegó al MOA (con sede en la base aérea de Torrejón, en Madrid) una vieja carpeta que encontró en los archivos el nuevo coronel de la División de Inteligencia del Estado Mayor del Aire (Cuartel General del Aire, Madrid), la persona precisamente con la que yo había “negociado” el comienzo de la desclasificación. Fernandez Rodas estaba muy sensibilizado con esto de la reagrupación de archivos. El archivo estaba repleto de documentos que hacían referencia a objetos de procedencia aeronáutica caídos a tierra (piezas de aviones, paracaídas, etc.) A pesar de no tener nada que ver con los OVNIS directamente, la hizo mandar al MOA. Ese paquete de viejos legajos contenía toda la información relativa al hallazgo en en Extremadura y Andalucía en diciembre de 1965 de las esferas y otros objetos metálicos de procedencia espacial, hoy hace 43 años. El oficial de inteligencia del MOA (teniente coronel Rocamora) procedió a aplicar a esta información los procedimientos seguidos para la desclasificación de la información OVNI. Sin embargo, finalmente, como en este caso la información no hacia la menor referencia a observación OVNI ninguna, al tratarse exclusivamente del descubrimiento y análisis de componentes de una nave espacial, no se incluyó en el inventario de informes OVNI y nunca se desclasificó (cierto que tampoco era material clasificado per se, al menos en España). En el curso de una de mis muchas conferencias telefónicas con la Sección de Inteligencia del MOA de aquellos días, se me informó de la llegada de esa documentación y su contenido. Siendo un apasiado por el fenómeno de las reentradas espaciales, y dado que este suceso de 1965 me había intrigado mucho desde que tuvo lugar, no tardé en solicitar autorización para consultar el archivo. Se me dio permiso enseguida; no sólo eso, me invitaron a examinar toda esa documentación in situ, donde en su momento me entregaron un juego completo de fotocopias (unas 400 páginas) de correspondencia oficial, memorandums e informes, tanto de fuentes españolas como norteamericanas. Recientes indagaciones han resuelto que la alineación de los restos esparcidos en el sur español y la fecha concreta (6 de diciembre de 1965) se correlacionan con la última órbita de la plataforma de un cohete SL-6. Se trató de un lanzamiento ruso no anunciado que tuvo lugar el día 3 de diciembre con la probable misión de realizar un aterrizaje suave del Lunik 8 en la superficie lunar. Sin embargo, el retrocohete no se disparó a tiempo y la nave espacial impactó sobre la Luna en la zona conocida como Mar de las Tormentas. El cohete portador se desintegró sobre España y los restos que sobrevivieron son el objeto de este artículo. Las principales conclusiones del informe Battelle –usando herramientas de análisis mucho más sofisticadas- confirmaron lo que los técnicos españoles habían encontrado. Había cuatro botellas esféricas y la carcasa cilindrica de un motor de cohete, todo ello fabricado con aleaciones de titanio, con rastros de acero y molibdeno. Las tres esferas mayores eran recipientes para almacenar gas a presión, la esfera menor posiblemente fuera un componente de un sistema de reserva de hidrógeno dotado de una válvula de control remoto. El motor del cohete servia obviamente para proveer propulsión. Se dedujo que durante la desintegración se alcanzó una temperatura superior al punto de fusión del titanio (1.650º C) durante un breve tiempo. Al poco de que partes de la nave alcanzaran esas temperaturas, la velocidad y la fricción se redujeron hasta enfriarlas, estimándose que su temperatura era cercana a la temperatura ambiente (ciertamente menor de 300º C) en el momento del choque con el suelo. La velocidad de impacto se calcúla estaría en el rango de 200 a 400 km/h. El 3 de febrero de 2009 he solicitado formalmente al comandante en jefe del Mando Aéreo de Combate (MACOM), sucesor del antiguo MOA, que libere la totalidad de documentos relativos a este suceso astronáutico, en base a su relación con una observación OVNI civil. V.J. Ballester Olmos revisa algunos de los documentos de este incidente en su estudio. © J. Cuéllar/EL MUNDO. (2) Ballester Olmos, Vicente-Juan, Expedientes Insólitos, Temas de Hoy (Madrid), mayo de 1995. 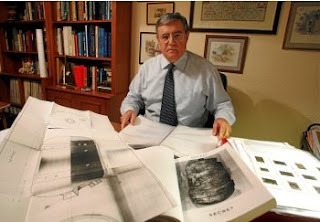 (3) Ballester Olmos, Vicente-Juan, “UFO Declassification in Spain (Military UFO Files Available to the Public: A Balance)”, en UFOs: Examining the Evidence, Mike Wooten (ed) , BUFORA (Inglaterra), agosto de 1995, páginas 51-56. (5) Ballester Olmos, Vicente-Juan, “Monitoring Air Force Intelligence (Spain’s 1992-1997 UFO Declassification Process)”, en MUFON 1997 International UFO Symposium Proceedings, Walter H. Andrus, Jr. & Irena Scott (eds), MUFON (Seguin, Texas), julio de 1997, páginas 139-178. La investigación ufológica posee pocas certidumbres y, desafortunadamente, son cuando se resuelven avistamientos. nicamente cuando se puede demostrar que una observación dada se debe a Venus, un avión, un bólido, un globo o un objeto convencional, uno llega a alcanzar la naturaleza auténtica de un suceso. En el resto de los eventos, agrupamos bajo el paraguas semántico de “objetos volantes no identificados” un conglomerado de hechos diversos con un amplio rango de fiabilidad, extrañeza y contenido documental. A veces ni siquiera son objetos, en otras no volaban y probablemente se podrían identificar si dispusiéramos de más información sobre lo ocurrido. En cuanto a los mejores casos, siempre están pendientes de recibir más datos, de una mejor investigación. Por ello, porque los casos aclarados (los OVIS) forman parte del problema y además aportan certezas, creo que es muy práctico publicar ejemplos de tales certezas, o sea, de misterios resueltos. A mi juicio, cuantas más falsas incógnitas se hagan públicas, más tiempo unos y otros podremos dedicar a los casos clave, que son aquellos que parecen presentar facetas verdaderamente anómalas. Basado en esta filosofía, y con el valor añadido del proceso de aprendizaje y la utilidad de los informes explicados como muestras aleatorias comparativas en un proceso de análisis estadístico, este blog regularmente mostrará crónicas de “los OVNIS que nunca lo fueron”. Siguen dos ejemplos. Precedido y seguido por intensa actividad meteórica, el 21 de noviembre de 1997 un turista británico alcanzó a filmar el desplazamiento por el cielo nocturno de una potente luz a las 01,30 horas. Fue en la playa de Puerto Rico, al sur de la isla de Gran Canaria, en las Islas Canarias (territorio español en el océano Atlántico, cerca de las costas de frica). La brillante luz en movimiento resultó ser causada por la desintegración en la atmósfera de un cohete propulsor ruso del tipo Soyuz, que sirvió para poner en órbita terrestre al satélite de investigación geofísica Resurs F-1M. Los datos que arroja el NORAD le asignan a la reentrada de este objeto una sección de radar (radar cross section) de 26,5 m2. Como complemento visual que juzgo de gran interés, he incluido aquí el video en cuestión. VÍDEO 1. Despliegue luminoso avistado y registrado en video desde Gran Canaria el 21 de noviembre de 1997. © Gary Chapman. • ¿Estructura volante sobre la Tierra? Veamos ahora la cruda realidad. En una comunicación remitida el 13 de noviembre de 2008 a “Equipe UFO”, un foro compuesto por los asesores de la brasileña Revista UFO, el ufólogo Roberto Pintucci explicó que las imágenes son las de una plantación en el desierto, probablemente en Israel. Afirma que ha visto semejantes estructuras agronómicas a través de Google Earth. ¿Y por qué no me sorprende? Ahora nos proponemos comentar la información en bruto generada por los informes pertenecientes al período 1980-1989, una década que arroja 843 registros en nuestro catálogo, la cifra más baja desde la década de los 50. La tendencia al alza del número de casos observada en los 60 y 70 se quiebra en los 80, para volver a recuperarse y crecer en los 90. Debe haber una causa para este hecho, sea económica, sociológica o política, que pide a gritos una interpretación. Característica fotografía de un “platillo volante” durante los 80. Charleston, Carolina del Sur, 4 de abril de 1980. © William J. Hermann. 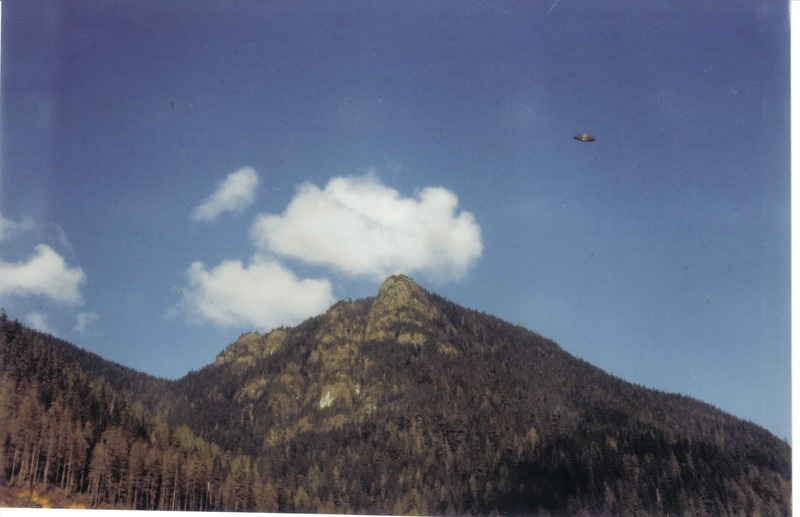 Fuente: Wendelle Stevens y August Roberts, UFO Photographs Around the World Vol 3, UFO Photo Archives, 1993. El primer y último año (1980 y 1989) marcan los puntos álgidos en cuanto a casos denunciados, mientras que los ocho años restantes presentan un nivel de observaciones fotográficas de casi la mitad, siendo 1987 el año con la menor tarifa. ¿Qué ocurrió ese año para propiciar ese mínimo? La proporción OVNI/OVI es de 59 a 41 en esta década. Estos porcentajes se mantienen bastante estables durante este período, con tres excepciones: 1982 y 1984 muestran ratios OVNI del 72% y 74%, respectivamente, lo que es debido a la incidencia de muchos eventos de lo que hemos dado en llamar “fenómenos Hessdalen” y –sensu contrario- el año 1987 presenta un porcentaje OVI del 60%, que se explica por las muchas entradas fraudulentas correspondientes a los trucajes en Gulf Breeze de Ed Hanson, alias Ed Walters. Los Estados Unidos encabezan la lista, como se podía esperar por tamaño del país y población, multiplicado por la popularidad del tema allí. Le siguen España (país del autor, en donde se ha realizado una intensa labor de búsqueda de casos), Noruega (efecto combinado de la emergencia de los fenómenos de Hessdalen y de la recopilación de casos nacionales hecha por Ballester y Brænne) y Argentina (suma resultante de un proyecto especial llevado a cabo entre Ballester y Ferguson). No hay otros aspectos más significativos en la distribución regional de los informes. Imagen de disco volante de un objeto invisible aparecido en una fotografía sacada en la isla de Vancouver (Canadá), el 8 de octubre de 1981. © Hanna McRoberts. Fuente: Dr. Richard F. Haines. Una vez más constatamos un mapa caótico. Mientras en 1988 abundaron los casos en los Estados Unidos (principalmente debido a la locura de Gulf Breeze), fue 1982 el año pico en Noruega (por el reconocimiento público de las luces del valle de Hessdalen), 1980 en España (sin razón aparente) o 1985 en Argentina (debido al considerable número de avistamientos fotográficos que dejó la aparición de los globos MIR durante las jornadas del 18 de agosto y 17 de septiembre de 1985). El 25 de julio de 1979, Federico Ibáñez Ibáñez, un agricultor de 54 años del pueblo valenciano de Turís dijo haber sido testigo de la presencia de un objeto de color blanco en forma de “medio huevo” posado sobre un camino rural de acceso a sus campos de vides. Dos seres bajos de extraña apariencia que llevaban anchas vestimentas blancas y portaban largas “gafas” oscuras salieron de detrás de un algarrobo cercano, corriendo hasta penetrar dentro del objeto por su parte trasera. El objeto se elevó rápidamente para desaparecer pronto de su vista. Hay razones objetivas para afirmar que este ha sido uno de los casos de aterrizaje más concienzudamente encuestados de España, lo que se hizo por parte de dos equipos de investigadores al poco de ocurrir los hechos. Primero por parte de AVIU, un grupo de universitarios de Valencia liderados por Juan Antonio Fernández Peris. Un detallado informe de 14 páginas, combinando los resultados de la investigación de campo de AVIU y de Vicente-Juan Ballester Olmos y Miguel Guasp se publicó en el libro de los dos últimos, Los OVNIS y la Ciencia (Plaza & Janés, 1981 y 1989). Transcurridos 30 años, en septiembre de 2008, volví a visitar al testigo para una re-encuesta, esta vez en compañía de Luís R. González. Dos meses después repetí mi visita a Turís, acompañado del fotógrafo Rafael Márquez, y en esta ocasión complementamos la investigación desplazándonos al lugar del aterrizaje con el testigo, con quien rememoramos lo sucedido. Terminamos hablando con varios habitantes del pueblo. A sus 84 años, Federico Ibáñez (a la izquierda), testigo del aterrizaje de Turís posa con V.J. Ballester Olmos en la re-encuesta de 2008. © Luís R. González (foto hecha con un teléfono móvil). En conclusión, creemos que es improbable que el testigo se haya inventado la historia (en base a patrones habituales): el relato parece sólido, se mantiene estable con el paso del tiempo, sin dejar al descubiertos fallos y contado por una persona sana y totalmente normal, un agricultor acomodado y con excelente reputación entre sus convecinos. Un testigo ocular único sin otros que lo corroboren (un repetido patrón, por desgracia, entre los avistamientos cercanos más asombrosos) y una apariencia de los seres que es bastante atípica en la literatura de los EC, son los puntos más desfavorables. Por último, las huellas encontradas en 1979 en la zona del aterrizaje por los primeros investigadores podemos contemplarla como evidencia complementaria, aunque circunstancial. Como solía decir J. Allen Hynek, “personas creíbles narran historias increíbles”. Por consiguiente, seguimos afrontando la misma situación que Jacques Vallée supo resumir de forma genial en los años sesenta, cuando en uno de sus libros escribió que (los aterrizajes) representan el misterio de los OVNIS en su forma más crucial porque éstos nos obligan a elegir entre la realidad de un fenómeno sin precedentes y la hipótesis de que todos los testigos son mentirosos del tipo psicológico más extremo (citado en The UFO Investigator, volumen V, número 1, septiembre-octubre de 1969). Sin embargo, Carol ofrece esta sugerencia para los aficionados que deseen implementar esta técnica de manera sencilla: Si usted no está seguro de entrar en esto de la fotografía en estéreo, pero quiere ver si puede conseguir una foto tridimensional, la manera más fácil es usar su cámara de siempre y tomar dos fotos usando el método de los astronautas (porque es lo que hicieron en la Luna para conseguir fotos en 3-D con una Hasselblad). Todo lo que tiene que hacer es componer la imagen a través del visor, apoyar todo su peso sobre su pierna izquierda y hacer la primera exposición, luego apoye su peso sobre la pierna derecha y haga la segunda foto. Tapa del último libro de Paolo Toselli. Muy brevemente, pero no quiero dejar de comentar dos libros interesantes que acaban de publicarse en Europa. El primero se titula Alessandria 1978. Allarme UFO (Alessandria 1978. Alarma OVNI) y es un pequeño volumen en italiano escrito por Paolo Toselli, veterano ufólogo, directivo de la envidiable organización CISU y buen amigo. En cien páginas la imponente oleada que sacudió Italia y concretamente la provincia de Alessandria entre septiembre y diciembre de 1978 dejando un rastro de casos de encuentros cercanos, huellas en los campos, luces nocturnas, fotos, etc., queda bien evocada por un especialista en este periodo. Este opúsculo, que viene acompañado por un DVD con entrevistas y videos relativos a la oleada y a las investigaciones de Toselli, ha sido publicado por la mejor fuente de literatura OVNI en Italia, la editorial UPIAR de Turín. El libro puede adquirirse a través del siguiente enlace: http://www.upiar.com/index.cfm?artID=173. Libros colectivos dirigidos por un investigador carismático o erudito son corrientes en la literatura científica. En ufología, algunos de los mejores libros que han visto la luz pertenecen a la misma categoría, por ejemplo: Daniel S. Gillmor, Scientific Study of Unidentified Flying Objects (Bantam, 1969), Carl Sagan & Thornton Page, UFO’s-A Scientific Debate (Cornell University, 1972), Nancy Dornbos, Proceedings of the 1976 CUFOS Conference (Center for UFO Studies, 1976), Richard F. Haines, UFO Phenomena and the Behavioral Scientist (Scarecrow, 1979), Ronald D. Story, The Encyclopedia of UFOs (Doubleday, 1980), Hilary Evans & Robert Moore, UFOs 1947-1987 (Fortean Tomes, 1987), Thierry Pinvidic, OVNI. Vers une Anthropologie d’une Mythe Contemporain (Heimdal, 1993), o Hilary Evans & Dannis Stacy, UFOs 1947-1997 (John Brown, 1997). Portada del libro dirigido por Ricardo Campo. De enfoque multidisciplinario, el libro está claramente dividido en dos partes. La primera examina los fenómenos OVNI desde una perspectiva psicosocial, con las aportaciones de siete autores, la mayoría formados en ciencias sociales (periodistas, antropólogos y juristas) más un ingeniero de telecomunicaciones. La segunda parte tiene seis trabajos y la escriben tres astrofísicos, un físico teórico, un astrónomo y un periodista. Todos ellos analizan el complejo estudio de la vida en el universo. Como Alfonso Ferrer ha señalado en una reseña de esta obra: Constituye una reflexión honesta sobre el estado de la cuestión al que debe enfrentarse cualquiera que de verdad se apasione con el estudio de los OVNIS. A ello añadiría que perspectivas escépticas de alto calibre y bien documentadas (no especulación de salón) nos ayudan a mantener afilado nuestro utillaje de investigación en esta materia tan extremadamente complicada. Como hacemos cada año, la bibliografía de investigación y literaria de Vicente-Juan Ballester Olmos se ha actualizado y colocado en Internet. Muestra una completa relación de trabajos, artículos y libros publicados entre febrero de 1965 y el 31 de diciembre de 2008, 44 años de dedicación personal al estudio de los OVNIS. Se puede encontrara aquí: http://cdufo.info/bib/bibliog1.pdf.